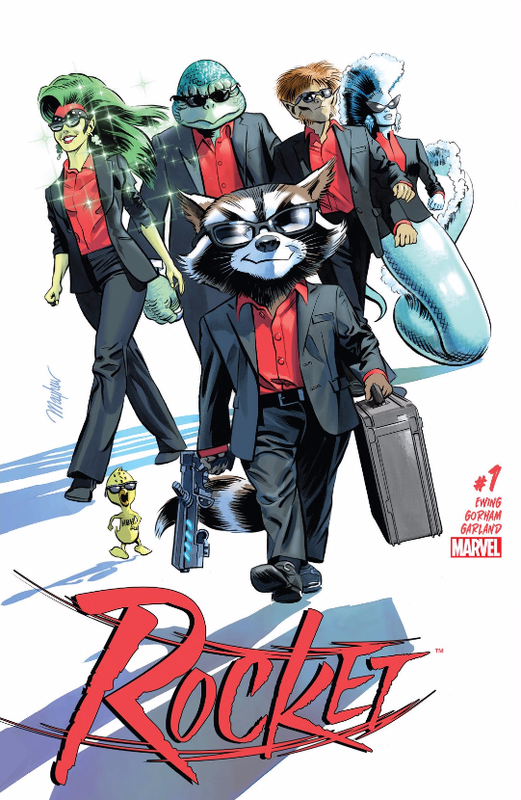 This is a tremendously strong and original issue, treating Rocket as more of a three-dimensional character than ever before. Back when Guardians of the Galaxy released in 2014, the film’s success took Marvel by surprise. The months after saw the publisher release a flurry of solo comics starring the Guardians; Groot, Star-Lord, Rocket, etc. None of them lasted very long, however. This time around, Marvel’s making a concerted effort to take advantage of the release of Guardians of the Galaxy Vol. 2. They know the film’s set to be one of the most popular blockbusters of the year, so they’re having a go at launching a whole range of Guardians books. 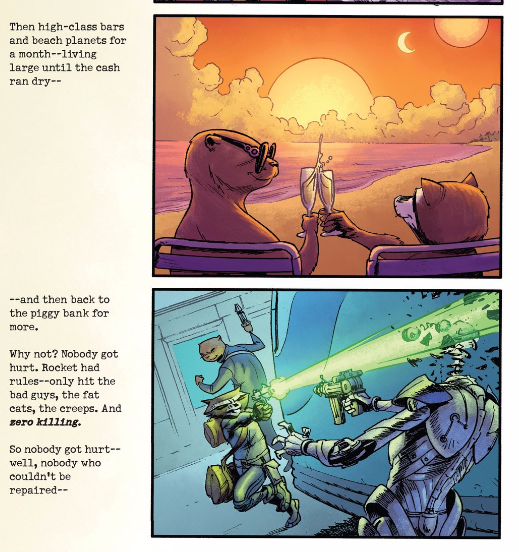 Rocket – starring the hero who’s most definitely not a raccoon – is the latest. I don’t mind admitting that I have concerns about this strategy. Recent comments from retailers suggest that modern comic book fans aren’t interested in following a range. Instead, they’ll choose a single book to follow, and then settle down and be happy with it. That’s why, for example, Black Panther performed well – but, when Marvel released World of Wakanda, sales of both titles dropped. So I can’t help but to be concerned that the House of Ideas is following the wrong strategy here. That said, here’s the thing. Though I do have concerns about Marvel’s strategy, I can’t deny that this is a great comic. Al Ewing is one of Marvel’s best, and right from the start he signals that this is Rocket like we’ve never seen him before. 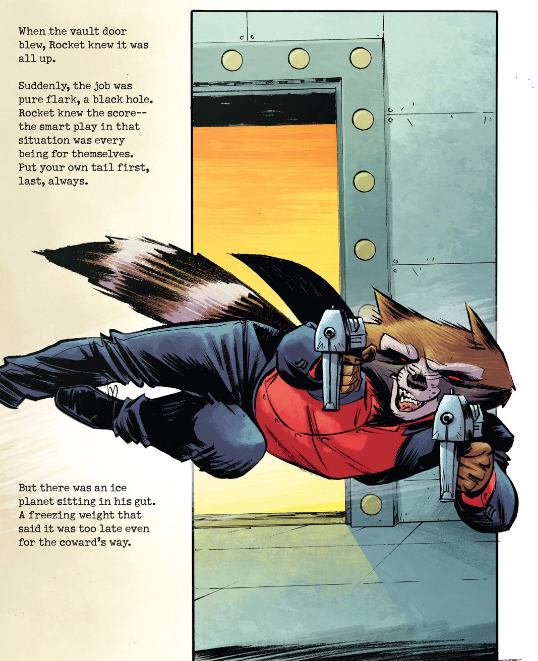 He kicks things off by giving a scene reminiscent of Rocket’s drunken rant in the first Guardians movie, adding an extra degree of humor by having the character refer to Earth superheroes. The dialogue is on-point and seriously entertaining. Then, Ewing twists things around completely, as we meet Rocket’s ex. It’s strange that after all these years reading comics featuring Rocket, I’d never once thought about his love-life. Ewing’s script is remarkable in that it literally treats Rocket like any other character, right down to exposing his romantic entanglements. Right from the start, Ewing gives a level of care and attention to the hero that I don’t think I’ve ever seen before. He continues to mix things up, too, giving the book’s plot a distinctive Mission Impossible style. This first issue is the story of a heist, and Ewing revels in all the classic tropes – right down to Rocket’s assembling a crew. Of course, as always, it’s the crew that gets a guy in trouble, and the issue ends with a moment that will make old fans of Chris Claremont’s Excalibur beam. Adam Gorham’s art is tremendous in this issue. He truly captures all the characters, giving each a sense of individuality, of uniqueness. You can tell he has great fun with Rocket’s allies, the Technet, and he doesn’t try to tone down their strangeness at all. Meanwhile, he gives us some beautiful glimpses of Tarka’s World, and takes the time to really indulge himself in world-building. I suspect some fans will complain about the number of splash pages at the book’s beginning, but personally, I’m fine with that – they serve a purpose, setting the tone and style of Rocket #1 and really making this comic stand out from the crowd. Right now, if retailers are to be believed, fans aren’t looking for a new range to follow – they’re looking for individual comics. If that really is the case, I strongly recommend trying out this book.